I’m from the wonderful City of Brotherly Love, better known as Philly or Philadelphia if you want to be technical. That’s right folks, I have the pleasure of living in the same town as some very well-known historic landmarks such as the Liberty Bell, Independence Hall and the ever so famous icon….The Philly Cheesesteak. No one, and I mean no one, visits this fare city without delving into the wonderful world of crusty rolls, rib-eye beef and of course … melted cheese. It’s your duty as a visitor to partake in the consumption of this local delicacy. Here’s a little heads-up to the outsiders who believe that they can walk into any Philly eatery, order a cheesesteak and therefore claim to have lived the experience. No, that’s not how it works around these parts. We actually have our own Cheesesteak etiquette if you will. Yes, there are rules. First you must master the ordering procedure, then and only then, can you venture out to indulge. When ordering one does not just walk up to a counter stating “Can I have a cheesesteak?” not unless you want to be stared at as if you are an alien of some sort. Don’t let that Brotherly Love stuff fool you, we can be a tough town and our patience have been known to run thin…especially in a cheesesteak line. So please, for the love of god have your order and money ready. You will need to follow these instructions carefully….very carefully when ordering. Once you have your ordering method memorized and money in your hand you are ready to venture out to a location that will allow you to have the best authentic cheesesteak experience. Hmm where to go? Well, chances are if you ask around town you’ll be steered in the direction of Pat’s and Geno’s. Just imagine a Hatfield & McCoy rivalry with meat and cheese. These 2 famous eateries have been partaking in a friendly competition for over 4 decades to claim fame as Best Cheesesteak in Town. They are kind enough to keep their grills sizzling 24 hours a day to satisfy your taste buds whenever they feel the need to be slathered by one of Philly’s finest. Believe me when I tell you a cheesesteak never tasted better than at 3 in the morning after a night on the town. If I was asked to cast my vote between the 2, it would go to Pat’s. However, these aren’t the only two guys in town who can assist you in your quest for experiencing the authentic flavor of a Philly Cheesesteak. You can also check out Jim’s, Tony Luke’s, John’s, Steve’s, Rick’s, Soni’s, McNally’s, Shank’s, Campo’s and Dalessandro’s … just to name a few. Everyone has their own reasons for liking one cheesesteak over the other. For some it’s the roll, others the quantity of meat vs. distribution of cheese. It’s serious business. My hubby likes Philly Steak & Hoagie for the roll, while my son enjoys Steve’s Prince of Steaks due to the size. 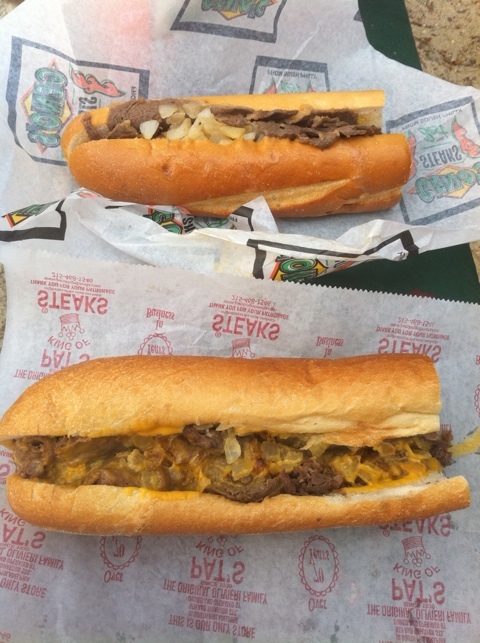 My daughter enjoys the dripping cheese on a Pat’s steak and for me … well, I crown Dalessandro’s as “Best Cheesesteak in Town” for the texture of the meat. So, whether you’re Wit or Wit-out (pronounced Widout) either way … Enjoy the Ride! I just had dinner and now… I could go for cheesesteak wit provolone, yum!!!! Oh yum, I’d love to a true-blue Philly cheese steak now.. they are beyond good .. It really could be….the fear is line is priceless. Hey yous! welcome to Fluffia! I’ve only ever had one Philly Cheesesteak in my life and boy, was it memorably yummy. Just thinking about it is giving me calories. Definitely have to get back there again one day. Now I can say I know someone from Philly! I have to say I was a little disappointed though – I was expecting more info. like – do all Philly Cheesesteaks have green peppers & onions? Can you pick the type of cheese? Do you get your choice of condiments? Once you choose “wit” or wit-out” you are then and only then, free to add the “other” condiments or toppings. My kids went for college visits in Philadelphia and I all heard about were the Cheese steaks…not a word about schools! Thanks and next time I’m in Philly, I’ll know how to order and where to go to get my Cheese Steak Fix. Can you really get one oozing with cheez whiz? I have to say I have tried many “Philly Cheesesteaks” and always wondered what all the fuss was about. My love of a “David’s” Steak Hoagie (from Niagara Falls,NY) has me continually trying the Philly Cheesesteaks only to be disappointed. Of course, I have never had a REAL Philly Cheesesteak as you have described them. 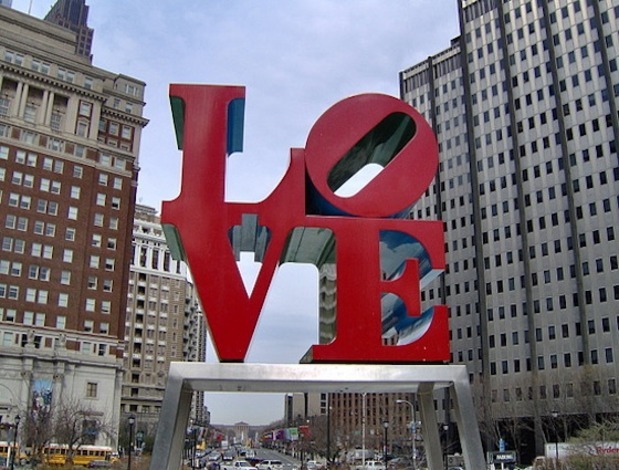 I’m thinking a trip to “The City of Brotherly Love” is in order…soon. This just made me so hungry. I keep seeing Ben Franklin ordering a cheesesteak. I hate to admit this, but I’ve never had one but being the cheeseaholic I am, I’m in. I am so in awe of you being around all that history…sigh. 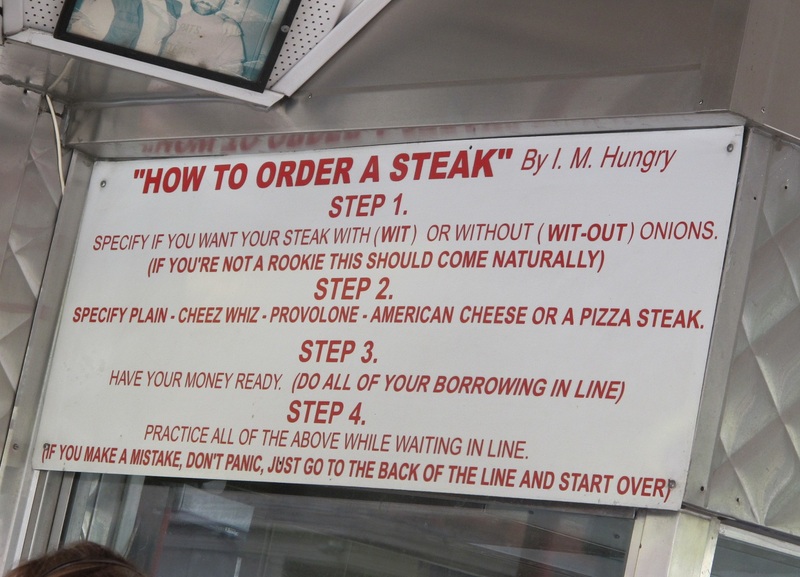 I had no idea ordering a cheesesteak would be so complicated. Can I just have some cheese instead? Excellent advice! But my first stop would be to come and see you in person! I would love to go to Philly and get me a Cheesesteak! While there I would go to the art museum too. p.s. I found your spelling of ‘fare’ city to me most appropriate to the post… I’m hungry now! The Art Museum is an incredible, inside & out. “Fare” was intentional and you are the only one who noticed…kudos Ted! Been to Philly many times and get mine WIT and with cheese wiz of course! Damn, this post just made me hungry! Can’t wait for my next visit to Philly!